The interactive seminar was great fun, because I did not make a presentation of what was in the book, I merely answered questions that people asked and gave examples from session to illustrate the answers. One woman came in grieving for her dog and I explained that the reason she was grieving was that the dog was grieving because the dog was still accompanying her and she was not giving him the usual attention. I asked her to acknowledge the dog’s presence whenever she was aware of his presence. By the end of the seminar, she and the dog were doing much better. We had a good crowd of people who had great questions for me. People even came from Christiansburg and Blacksburg which is an hour away. Gretchen helped by shooting a video of the event and I will post the link when it is uploaded to Vimeo. 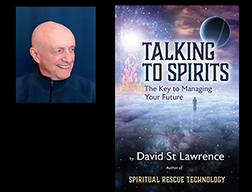 Author and Spiritual Counselor David St Lawrence will share tales from his 43 years as a spiritual counselor with his latest book, “Talking To Spirits”. 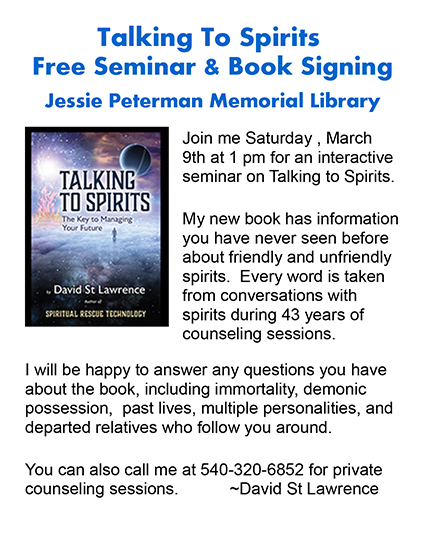 On Saturday, March 9th, from 1pm to 3pm, he will be discussing his adventures and signing copies of his books at the Jessie Peterman Memorial Library 321 W. Main Street, Floyd, Virginia. In his many years as a spiritual counselor and spiritual healer, he has lifted curses, cleared haunted houses, counseled departed relatives, rescued beings trapped in crystals, and helped hundreds of people handle the voices in their heads and problems with their bodies. He now concentrates on teaching others to talk to spirits and holds weekly online workshops and webinars where he lectures and does live sessions on volunteers and their spirits. 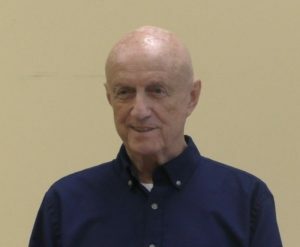 The author has written four books, one about surviving corporate life and the other three about his discoveries in the spiritual realm. All of his books are available on Amazon,com: Danger Quicksand – Have A Nice Day, Introducing Spiritual Rescue Technology, Using Spiritual Rescue Technology, and his latest, Talking To Spirits. His long transition from corporate executive to blogger to independent designer/craftsman took place in parallel with his interest in the spiritual realm which started in 1975 with a spiritualist in Ft Lauderdale, Florida. He finally realized that the real answer to the insanities of the business world lay in exploring the effects spirits have on people’s lives. His last three books describe how spirits influence our lives and provide a way that almost anyone can take control of their futures. It’s Tuesday, February 12th, and one of the coldest, rainy days you can imagine, so I was pleasantly surprised to discover a new piece of technology, Otter Voice Notes, which will brighten up the lives of my creative friends like yourself. Otter is a smart note-taking app that empowers you to remember, search, and share your voice conversations. Otter creates smart voice notes that combine audio, transcription, speaker identification, inline photos, and key phrases. I am just beginning to use this application, but I am tremendously impressed. Comparing this to Dragon Naturally Speaking is like comparing a 2019 Honda Insight to a hand cranked Model T automobile. I have tried to use Dragon Naturally Speaking several times over the years and have finally given up because it was cumbersome and would not keep up with me most of the time. The Otter AI app runs on a smartphone or on a computer and it uses an online connection for the translation to text. If you are recording and your device is not online, it will store the audio and then translate to text when the online connection is resumed. You will see that it is using artificial intelligence because it will correct the text as it prints the words out. I use a fairly non-standard vocabulary and am impressed with the way that Otter AI handles my transcriptions. It is free for 600 minutes a month and that should handle me for a while. I host one hour webinars every week and there is valuable information in them to be transcribed for books and articles. we continue to follow this through time and space. And I think the best thing I can do while I’m still discovering what’s going on is to help others. To keep moving. You see, if, if, if, for instance, you’re stuck on something because your mother did something awful to you. You’ve stopped. You’re still – your attention is still stuck back on how could mom have been so cruel or how could I have been so stupid to let her do it or what ever. See? Instead of like, Okay, here we are, it’s 2019, the world’s going to hell and we’re going with it and let’s party! you know, anybody got a glass of wine and a cigarette and we can all sit here and swap stories – like when we used to, you know, raid the English coast and terrify the natives. I knew you’d get a kick out of that Viking story. I plan on using this last feature as soon as I can set it up. This is extremely valuable when discussing new research.